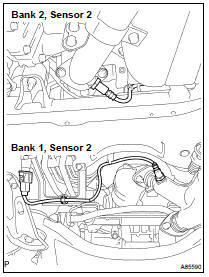 (a) Remove the 2 heated oxygen sensors (bank 1, 2 sensor 2). (b) Remove the pipe tail from the exhaust pipe supports. (a) Remove the 2 bolts and pipe center from the exhaust pipe front No. 3. (a) Remove the 2 nuts and pipe front No. 3 from the exhaust manifold. (b) Remove the 2 bolts and pipe front No. 3 from the exhaust pipe assy front. (b) Remove the 2 nuts and pipe. (a) Install 2 new gaskets and the pipe with the 2 nuts. Torque: 56 NVm (571 kgfVcm, 41 ftVlbf) (b) Tighten the clamp. (a) Install 2 new gaskets to the pipe front No. 3. (b) Install the front pipe No. 3 to the pipe front with the 2 bolts. Torque: 56 NVm (571 kgfVcm, 41 ftVlbf) (c) Install the front pipe No. 3 to the exhaust manifold RH with the 2 nuts. 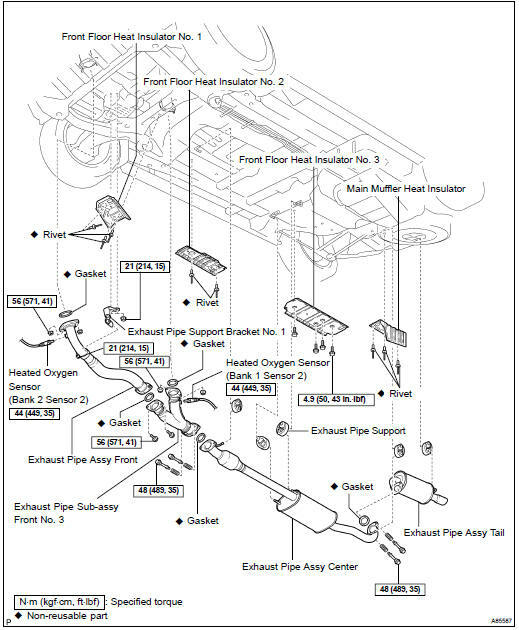 (b) Install a new gasket and the pipe center to the front pipe No. 3 with the 2 bolts. (a) Install the 2 heated oxygen sensors (bank 1, 2 sensor 2). After installing the sensor, check that the sensor wire is not twisted. If it is twisted, remove the sensor and reinstall it.